We serve leading international and national oil companies, oilfield-services and equipment providers, and private-equity investors across the entire oil and gas value chain. We help our clients develop strategies to manage risk, optimize their organizations, and improve performance. We build capabilities to deliver lasting improvement. 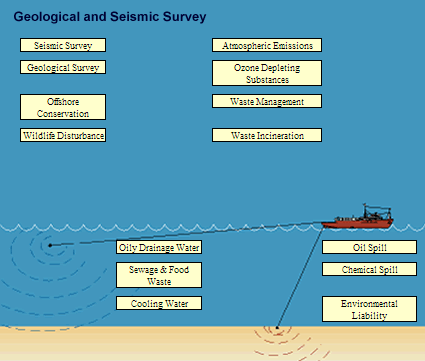 Offshore Activities: Geological and seismic survey, Drilling a well, Well test, Workover, New offshore pipeline, New Project or modification, Production, Chemical permits, Offshore waste storage and transfer, Oil and chemical spills, Decommissioning, Well suspension or abandonment. Onshore Activities: New onshore pipeline, New onshore project, Modification to onshore project, Waste disposal. Seismic Survey: At least 30 minutes before commencement of operation, make visual check for presence of marine mammals within 500 m of vessel. Hydrophones may also be used particularly in poor visibility; If marine mammals are present, the start of the survey should be delayed until they have moved away. Allow at least 20 minutes from the last sighting before commencing operations; Where equipment allows, build power up slowly from a low energy start allowing 20 minutes for marine mammals to move well out of range. Where seals are congregated around a platform, start survey at least 500 m away; Use lowest practicable power levels throughout survey. 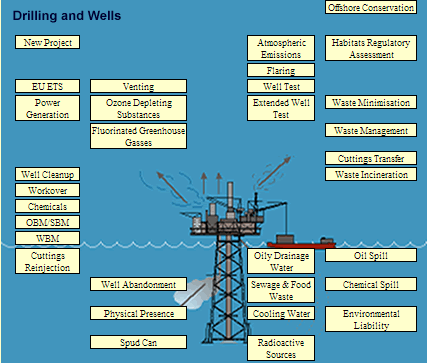 Drilling a well: Ensure compliance with any licence, exemption or consent permit conditions, including any commitments made in environmental statement (ES); Ensure any required spill prevention and oil spill response procedures are introduced to rig personnel and appropriate equipment is in place; Use only the permitted chemicals and mud system; If reinjecting cuttings, ensure alternative legal disposal methods are in place as back up if CRI fails; Routinely monitor base fluid use and discharge and sample and analyse the cuttings for oil content during drilling. Report findings of the sampling and analysis to the competent authority; Use technology and other techniques to prevent or reduce discharges of all chemicals. Monitor all use and discharge of chemicals and report quantities via EEMS reporting; Ensure compliance with OPPC. consider the implications of well cleanup and the need to minimise the possibility of reservoir hydrocarbon contaminated fluid being discharged. 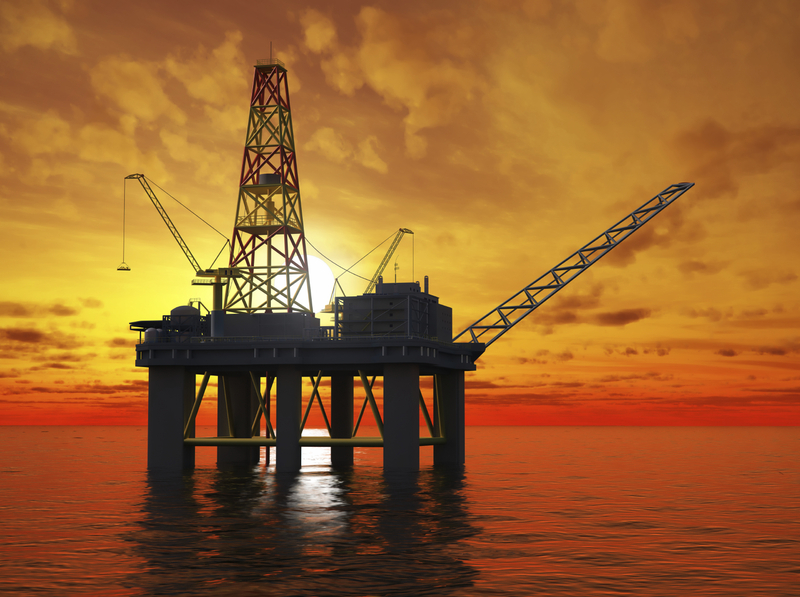 If discharging cuttings overboard ensure no contamination with oil from the payzone unless appropriate OPPC Permit is in place; Undertake any seabed environmental surveys as required by competent authority; Report any accidental discharge of oil, including OBM or SBM, to competent authority; Report any accidental discharge of chemicals, including drilling muds, to competent authority; Undertake all statutory reporting and EEMS reporting for each activity; Ensure renewed permit is in place if planned well is to continue beyond expiry date of initial permit. Production: Ensure oil content and total volume of produced water discharge meets OPPC permit requirements or any other target requirement; Undertake routine sampling and analysis of produced water. Undertake monthly reporting; Undertake routine sampling and analysis of produced sand. 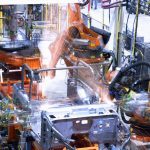 Undertake quarterly reporting; Machinery space drainage. Ensure oil content of discharge meets legal performance standard of 15 ppm (oil in water). Record findings of sampling and analysis in Oil Record Book. Keep records for 3 years; Combustion plant. Undertake monitoring and reporting of emissions as required by permit. Undertake emissions reporting via EEMS; Record quantities of crude oil stored, loaded and offloaded and calculate VOC emissions. Make annual emissions report. Ensure flaring and venting volumes are in compliance with consents. Meet consent reporting requirements and annual submission to EEMS. 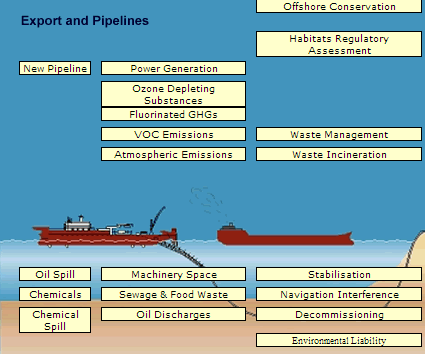 Report any compliance failure to the competent authority; Ensure EU ETS reporting undertaken and annual verification of emissions and improvements; Use technology and other techniques to prevent or reduce discharges of all chemicals. Monitor all use and discharge of chemicals and report quantities via EEMS reporting; Report any accidental discharge of oil to sea to HM Coastguard and the competent authority using PON1; Report any accidental discharge of chemicals to the competent authority using PON1; Keep OPEP up to date and undertake routine response training and exercises; No current limits on sewage and cooling water discharges; Ensure no garbage (including plastics) disposed of overboard. Only comminuted food waste to be discharged; Ensure Garbage Management Plan in place; Maintain records of waste types and quantities. Undertake required reporting. Ensure correct transferral documentation for transfer of waste, including non-hazardous waste and special wastes (in particular any radioactive or oily waste) to shore. Chemical Permit: Use technology and other techniques to prevent or reduce chemical discharges; Ensure justification for use is given for all chemicals flagged for substitution. 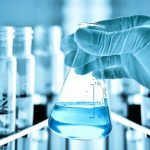 Encourage chemical suppliers to have programme in place to identify alternative chemicals; Monitor and record use and discharge of all chemicals. Report quantitites of chemicals used and dicharged via EEMS; Report any chemical spills to the competent authority using PON1. 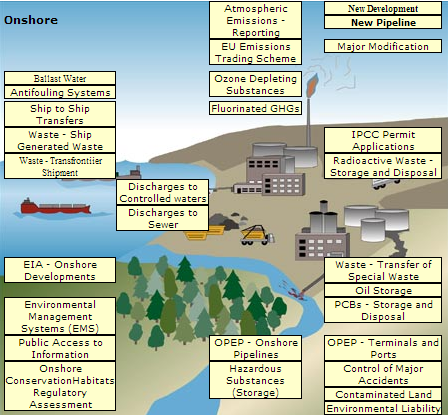 Offshore Waste Storage and Transfer: Ensure waste is correctly segregated to ensure recycling/reuse objectives and onward transport to shore requirements can be met; Ensure appropriate authorisations and placards are displayed; No overboard disposal of garbage. Ensure waste contained and secured in such a way so as to prevent loss overboard; Encourage waste minimisation and recycling/reuse/recovery of waste as far as possible; Ensure all Transfer Notes and Consignment Notes are retained as required. Oil and Chemical Spills: Ensure appropriate spill prevention and response measures are in place; Undertake regular oil and chemical spill response exercises as detailed in the OPEP; Ensure all personnel are trained in spill prevention, reporting and response measures. 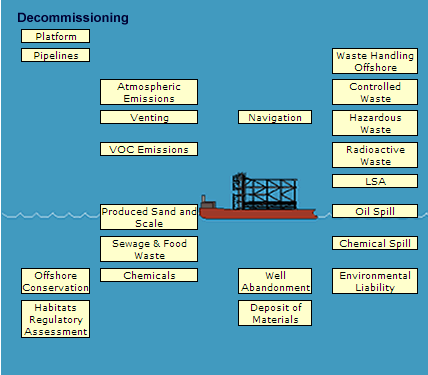 Decommissioning: Where pipeline or any part of any installation are left in place, locational data and surveyed depths to be submitted to the competent authority. Navigational aids must be installed and maintained for any remains that project above the sea surface; Ensure segregation of hazardous (e.g. 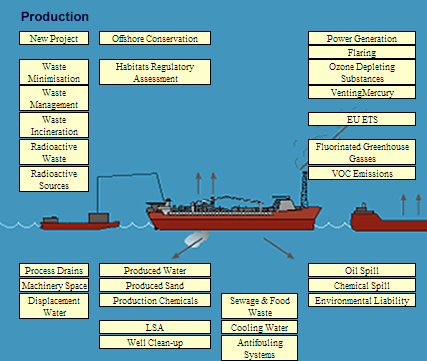 oily waste, asbestos and chemicals) and non-hazardous wastes. Ensure records kept of all hazardous (special waste) and consignment notes for transfer completed; Ensure compliance with all waste disposal licences and waste transfer documentation requirements for scrap metal and non-hazardous waste. Reuse or recycling is the preferred option; Following removal of debris, independent verification survey is required; Undertaken post decommissioning environmental seabed sampling survey to monitor levels of hydrocarbons, heavy metals and other contaminants. Survey strategy will have been agreed with the competent authority; Submit copies of all debris clearance and survey reports to the competent authority. 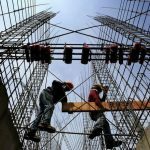 For many organizations effective EHS management are central components of strategic planning, resource management and regulatory compliance. YGP combines software, data and expertise into a comprehensive suite of sustainability management solutions to help you assess and respond to emerging issues, meet your company’s global compliance obligations and convert business risk to opportunity. Understand global supply and market dynamics for over 300 high-interest industrial chemicals.